In a sign that Beijing and Washington are ready to turn down the heat in the waters surrounding Taiwan and in the South China Sea, top defense and diplomatic officials from the two countries will sit down together this week for a fresh round of a bilateral security dialogue. 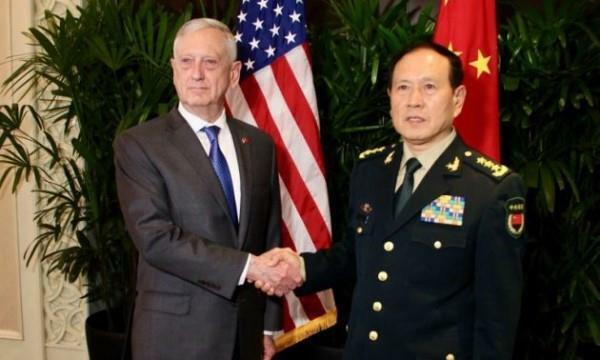 China's defense minister, Wei Fenghe, and chief of the Office of Foreign Affairs, Yang Jiechi, will meet with US Defense Secretary James Mattis and Secretary of State Mike Pompeo as part of a framework established at Mar-a-Lago when the two countries' current heads of state met for the first time. The US State Department confirmed the meeting on Monday, but did not provide any further details about the agenda. A trip by Wei Fenghe to Washington, scheduled for September, was canceled after the US slapped sanctions on a People's Liberation Army department and several officials. The US, meanwhile, has been conducting B-52 flyovers of contested South China territory and sailed a warship through the Taiwan Strait for the second time this year, prompting an outcry from Beijing. The two countries' top defense officials had a chance to meet in October on the sidelines of a multilateral security summit, but a senior Pentagon official suggested at the time that little progress was made in smoothing over disputes.